SAN JOSE, CA and IRVINE, CA--(Marketwired - Mar 19, 2014) - In just ten months, Bixby Land Company has transformed a four-building office park in San Jose, Calif. into a contemporary work environment that is now ready for occupancy. The firm has finished construction on THE Campus, a completely redesigned 250,000-square-foot office project that sets a new benchmark for companies seeking a vibrant, amenity-rich work place in Silicon Valley. "THE Campus has exceeded everyone's expectations with a vision that turns a deaf ear to conventional office development," said Bill Halford, president and CEO of Bixby Land Company. "This project offers a distinctive identity for companies that want an energetic and collaborative place to call home." Bixby's attention to the lifestyle needs of today's companies has come to define the firm's office development strategy. In the case of THE Campus, this includes stylish amenities that more closely resemble the ambiance of a boutique luxury hotel than an office building. 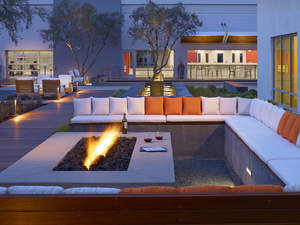 Couch seating areas, fire pits, an outdoor gourmet kitchen and outdoor dining areas differentiate THE Campus. Native, eco-friendly landscaping and calming waterscape provide a tranquil setting, while recreational options such as a bocce ball court, outdoor exercise deck and yoga area encourage a healthy work/life balance. "The California climate lends itself to a year-round outdoor lifestyle, and we want to give companies the opportunity for their employees to work where they are inspired and more productive," added Halford. "If a company is looking for a project with an amenity package on steroids, this is the place." "We're seeing more and more tenant requirements that want top-flight amenities in order to attract and retain the best talent in the Valley," said Rob Shannon, senior vice president at CBRE. Shannon and fellow CBRE brokers Christian Marent and Vincent Scott represent THE Campus. THE Campus is located at the northwest corner of Trimble Road and Orchard Parkway, adjacent to San Jose's North 1st Street Corridor, within one block of VTA light rail access and less than one mile from Highway 101. "Office designs have evolved in highly creative ways as technology and work trends reshape how business is conducted," added Halford. "This is the most fun we've had in the development business in a long time." Bixby Land Company is a leading commercial real estate operator and investment manager with a portfolio of office, industrial and R&D properties of approximately $1 billion. The company is active in the repositioning and redevelopment of office and R&D properties in select Western U.S. markets. Bixby is primarily engaged in core industrial investments and value add office and R&D properties. Bixby Land Company, a privately-held REIT, has a vertically integrated operating platform backed by a veteran management team. For more than 100 years, Bixby Land Company has been committed to adding value for its investors and shareholders. www.bixbyland.com. 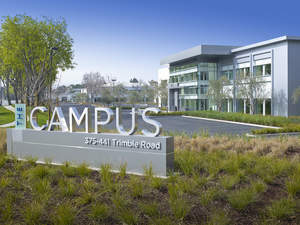 THE Campus is located at 375-441 Trimble Road in San Jose, Calif. THE Campus includes stylish amenities that more closely resemble the ambiance of a boutique luxury hotel than an office building.